In recent years, the exploit of GDI objects to complete arbitrary memory address R/W in kernel exploitation has become more and more useful. In many types of vulnerabilityes such as pool overflow, arbitrary writes, and out-of-bound write, use after free and double free, you can use GDI objects to read and write arbitrary memory. We call this GDI data-only attack. 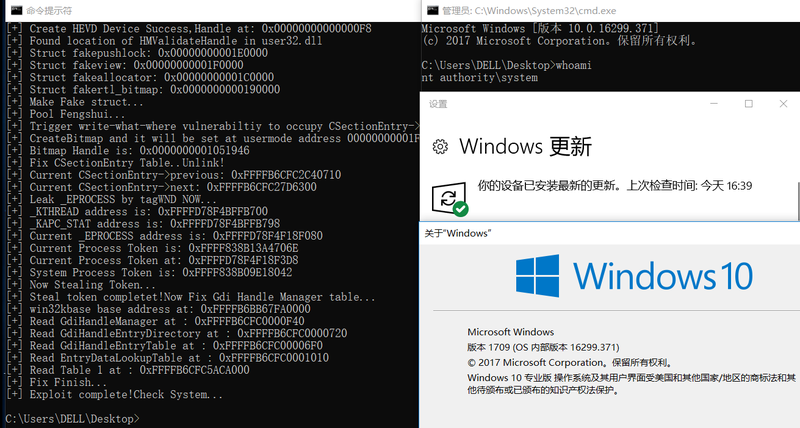 Microsoft introduced the win32k type isolation after the Windows 10 build 1709 release to mitigate GDI data-only attack in kernel exploitation. I discovered a mistake in Win32k TypeIsolation when I reverse win32kbase.sys. It have resulted GDI data-only attack worked again in certain common vulnerabilities. In this paper, I will share this new attack scenario. In the kernel structure of Bitmap and Palette, two important member-variables related to GDI data-only attack are Bitmap->pvScan0 and Palette->pFirstColor. Two member-variables point to Bitmap and Palette’s data field, and you can read or write data from data field through the GDI APIs. As long as we modify two member-variables to any memory address by triggering a vulnerability, we can use GetBitmapBits/SetBitmapBits or GetPaletteEntries/SetPaletteEntries to read and write arbitrary memory address. About using the Bitmap and Palette to complete the GDI data-only attack Now that there are many related technical papers on the Internet, and it is not the focus of this paper, there will be no more deeply sharing. The relevant information can refer to the fifth part. The exploit of GDI data-only attack greatly reduces the difficulty of kernel exploitation and can be used in most common types of vulnerabilities. Microsoft has added a new mitigation after Windows 10 rs3 build 1709 —- Win32k Typeisolation, which manages the GDI objects through a doubly-linked list, and separates the head of the GDI object from the data field. This is not only mitigate the exploit of pool fengshui which create a predictable pool and uses a GDI object to occupy the pool hole and modify member-variables by vulnerabilities. but also mitigate attack scenario which modifies other member-variables of GDI object header to increase the controllable range of the data field, because the head and data field is no longer adjacent. Here I will explain the important parts of the mechanism of win32k typeisolation. 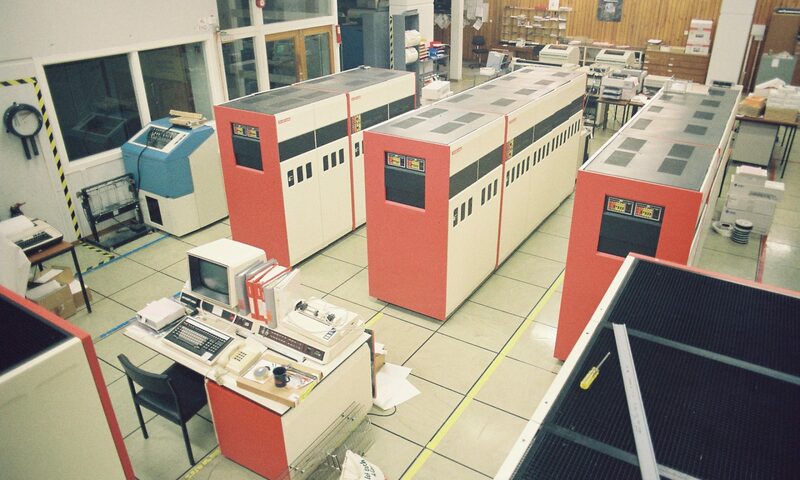 The detailed operation mechanism of win32k typeisolation, including the allocation, and release of GDI object, can be referred to in the fifth part. In win32k typeisolation, GDI object is managed uniformly through the CSectionEntry doubly linked list. The view field points to a 0x28000 memory space, and the head of the GDI object is managed here. The view field is managed by view array, and the array size is 0x1000. When assigning to a GDI object, RTL_BITMAP is used as an important basis for assigning a GDI object to a specified view field. 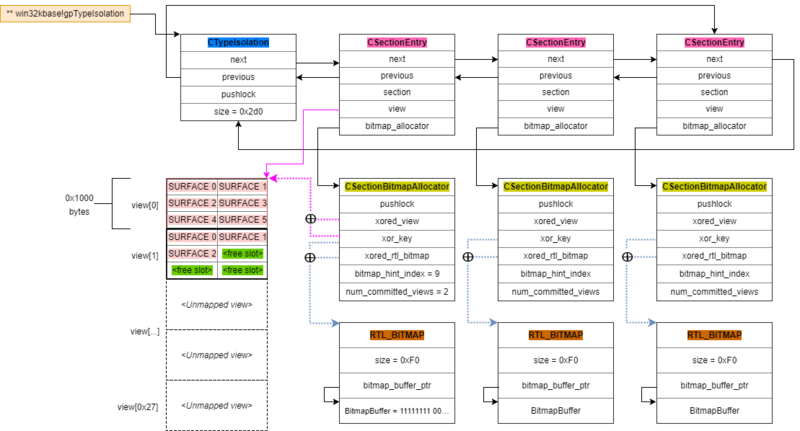 In CSectionEntry, bitmap_allocator points to CSectionBitmapAllocator, and xored_view, xor_key, xored_rtl_bitmap are stored in CSectionBitmapAllocator, where xored_view ^ xor_key points to the view field and xored_rtl_btimap ^ xor_key points to RTL_BITMAP. In RTL_BITMAP, bitmap_buffer_ptr points to BitmapBuffer,and BitmapBuffer is used to record the status of the view field, which is 0 for idle and 1 for in use. When applying for a GDI object, it starts traversing the CSectionEntry list through win32kbase!gpTypeIsolation and checks whether the current view field contains a free memory by CSectionBitmapAllocator. If there is a free memory, a new GDI object header will be placed in the view field. I did some research in the reverse engineering of the implementation of GDI object allocation and release about the CTypeIsolation class and the CSectionEntry class, and then I found a mistake. TypeIsolation traverses the CSectionEntry doubly linked list, uses the CSectionBitmapAllocator to determine the state of the view field, and manages the GDI object SURFACE which stored in the view field, but does not check the validity of CSectionEntry->view and CSectionEntry->bitmap_allocator pointers, that is to say if we can construct a fake view and fake bitmap_allocator, and we can use the vulnerability to modify CSectionEntry->view and CSectionEntry->bitmap_allocator to point to fake struct, we can re-use GDI object to complete the data-only attack. 4 Save and reborn gdi data-only attack! In this section, I would like to share the idea of ​​this attack scenario. HEVD is a practice driver developed by Hacksysteam that has typical kernel vulnerabilities. There is an Arbitrary Write vulnerability in HEVD. We use this vulnerability as example to share my attack scenario. First look at the allocation of CSectionEntry, CSectionEntry will allocate 0x40 size session paged pool, CSectionEntry allocate pool memory implementation in NSInstrumentation::CSectionEntry::Create(). In other words, we can still use the pool fengshui to create a predictable session paged pool hole and it will be occupied with CSectionEntry. Therefore, in the exploit scenario of HEVD Arbitrary write, we use the tagWND to create a stable pool hole. , and use the HMValidateHandle to leak tagWND kernel object address. Because the current vulnerability instance is an arbitrary write vulnerability, if we can reveal the address of the kernel object, it will facilitate our understanding of this attack scenario, of course, in many attack scenarios, we only need to use pool fengshui to create a predictable pool. 0xffff862e827ca220 is a stable session paged pool hole, and 0xffff862e827ca220 will be released later, in a free state. Now we need to create the CSecitionEntry to occupy 0xffff862e827ca220. This requires the use of a feature of TypeIsolation. As mentioned in the second section, when the GDI object is requested, it will traverse the CSectionEntry and determine whether there is any free in the view field, if the view field of the CSectionEntry is full, the traversal will continue to the next CSectionEntry, but if CTypeIsolation doubly linked list, all the view fields of the CSectionEntrys are full, then NSInstrumentation::CSectionEntry::Create is invoked to create a new CSectionEntry. Therefore, we allocate a large number of GDI objects after we have finished creating the pool hole to fill up all the CSectionEntry’s view fields to ensure that a new CSectionEntry is created and occupy a pool hole of size 0x40. 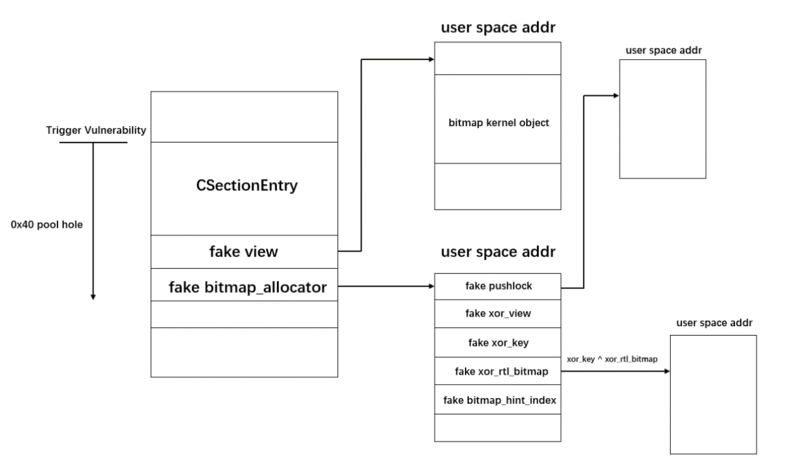 Next we need to construct the fake CSectionEntry->view and fake CSectionEntry->bitmap_allocator and use the Arbitrary Write to modify the member-variable pointer in the CSectionEntry in the session paged pool hole to point to the fake struct we constructed. The view field of the new CSectionEntry that was created when we allocate a large number of GDI objects may already be full or partially full by SURFACEs. If we construct the fake struct to construct the view field as empty, then we can deceive TypeIsolation that GDI object will place SURFACE in a known location. We use VirtualAllocEx to allocate the memory in the userspace to store the fake struct, and we set the userspace memory property to READWRITE. Among them, 0x1f0000 points to the view field, 0x1c0000 points to CSectionBitmapAllocator, and the fake view field is used to store the GDI object. The structure of CSectionBitmapAllocator needs thoughtful construction because we need to use it to deceive the typeisolation that the CSectionEntry we control is a free view item. The above CSectionBitmapAllocator structure compares with 0x1c0000 structure, and I defined xor_key as 0xdeadbeefdeadb33f, as long as the xor_key ^ xor_view and xor_key ^ xor_rtl_bitmap operation point to the view field and RTL_BITMAP. In the debugging I found that the pushlock must point to a valid structure pointer, otherwise it will trigger BUGCHECK, so I allocate memory 0x1e0000 to store pushlock content. As described in the second section, bitmap_hint_index is used as a condition to quickly index in the RTL_BITMAP, so this value also needs to be set to 0x00 to indicate the index in RTL_BITMAP. In the same way we look at the structure of RTL_BITMAP. Here I select a valid RTL_BITMAP as a template, where the first member-variable represents the RTL_BITMAP size, the second member-variable points to the bitmap_buffer, and the immediately adjacent bitmap_buffer represents the state of the view field in bits. To deceive typeisolation, we will all of them are set to 0, indicating that the view field of the current CSectionEntry item is all idle, referring to the 0x190000 fake RTL_BITMAP structure. Next, we only need to modify the CSectionEntry view and CSectionBitmapAllocator pointer through the HEVD’s Arbitrary write vulnerability. Next, we normally allocate a GDI object, call CreateBitmap to create a bitmap object, and then observe the state of the view field. You can see that the bitmap kernel object is placed in the fake view field. We can read the bitmap kernel object directly from the userspace. Next, we only need to directly modify the pvScan0 of the bitmap kernel object stored in the userspace, and then call the GetBitmapBits/SetBitmapBits to complete any memory address read and write. An exception happened while performing a system service routine. Ffffd7d8`95bd9847 488b1e mov rbx, qword ptr [rsi] ds:002b:00000000`001e0000=???????????????? After many tracking, I discovered that the main reason for BSOD is that the fake struct we created when using VirtualAllocEx is located in the process space of our current process. This space is not shared by other processes, that is, if we modify the view field through a vulnerability. After the pointer to the CSectionBitmapAllocator, when other processes create the GDI object, it will also traverse the CSecitionEntry. When traversing to the CSectionEntry we modify through the vulnerability, it will generate BSoD because the address space of the process is invalid, so here I did my first fix when the vulnerability was triggered finish. In the first fix, I modified the bitmap_hint_index and the rtl_bitmap to deceive the typeisolation when traverse the CSectionEntry and think that the view field of the fake CSectionEntry is currently full and will skip this CSectionEntry. We know that the current CSectionEntry has been modified by us, so even if we end the exploit exit process, the CSectionEntry will still be part of the CTypeIsolation doubly linked list, and when our process exits, The current process space allocated by VirtualAllocEx will be released. This will lead to a lot of unknown errors. We have already had the ability to read and write at any address. So I did my second fix. In the second fix, I obtained CSectionEntry->previous and CSectionEntry->next, which unlinks the current CSectionEntry so that when the GDI object allocates traversal CSectionEntry, it will deal with fake CSectionEntry no longer. After completing the two fixes, you can successfully use GDI data-only attack to complete any memory address read and write. Here, I directly obtained the SYSTEM permissions for the latest version of Windows10 rs3, but once again when the process completely exits, it triggers BSoD. After the analysis, I found that this BSoD is due to the unlink after, the GDI handle is still stored in the GDI handle table, then it will find the corresponding kernel object in CSectionEntry and free away, and we store the bitmap kernel object CSectionEntry has been unlink, Caused the occurrence of BSoD. It is worth mentioning here is the need to leak the base address of win32kbase.sys, in the case of Low IL, we need vulnerability to leak info. And I use NtQuerySystemInformation in Medium IL to leak win32kbase.sys base address to calculate the gpHandleManager address, after Find the position of the target bitmap object in the GDI handle table in the fake view, and set it to 0x0. Finally complete the full exploit. Now that the exploit of the kernel is getting harder and harder, a full exploitation often requires the support of other vulnerabilities, such as the info leak. Compared to the oob writes, uaf, double free, and write-what-where, the pool overflow is more complicated with this scenario, because it involves CSectionEntry->previous and CSectionEntry->next problems, but it is not impossible to use this scenario in pool overflow. If you have any questions, welcome to discuss with me. Thank you!